Runners use large muscles in the legs and hips to forcefully propel the body forward with one leg and land on the other leg to move quickly overground. Without adequate stabilization by deep hip and ankle muscles, the body relies more readily on passive structures for lateral support during this process, such as ligaments and tendons. Overuse of these passive structures by repetitive stress leads to most common running injuries including: achilles tendinopathy, plantar fasciitis, runners knee, and iliotibial band syndrome. Featured image by Ben Herndon Photography of Kristina Pattison running Lolo Peak, Montana. 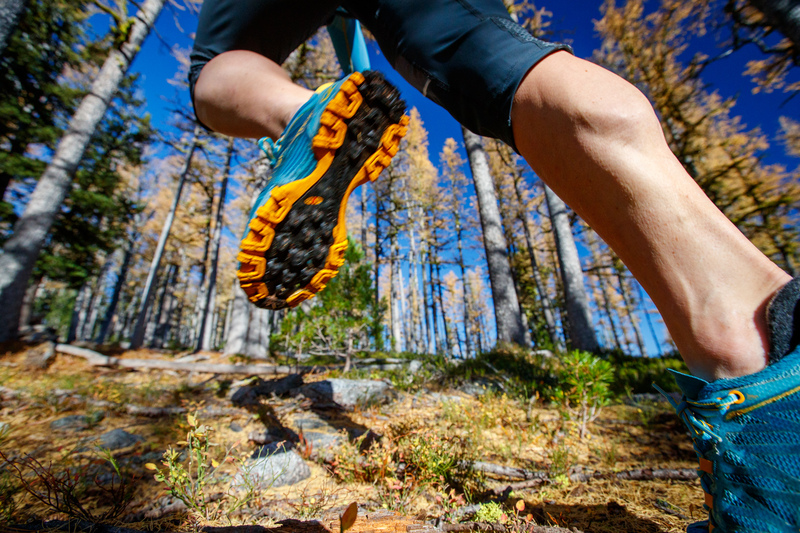 Keys to decreasing risk for running injuries include gradually progressing running volume to prepare these tissues for stress, and to consistently strengthen the active stabilizer muscles supporting these passive structures. Here are 4 quick moves that will keep the ankles and hips strong and stable, ensuring decreased risk for injury and improved running speed. With a resistance band anchored on a stable object, place the looped end around the forefoot. Keep the foot pointed straight forward and move foot up and down. Repeat on opposite foot, then face the opposite direction and repeat. Keeping the shin still, move foot in and out to work muscles on the side of the shins. Keeping the leg straight and foot pointed straight forward, move the whole leg in and out to work the hips. Repeat on both sides, then face the opposite direction and repeat. Keeping the leg straight raise up onto the ball of the foot. Repeat with knee bent. Then repeat on the opposite side. Kristina Pattison is a professional ultra endurance mountain runner from Missoula, Montana. She works as a doctor of physical therapy and certified strength and conditioning specialist at Missoula Bone and Joint Physical Therapy. Kristina specializes in rehabilitation of athletes and runners, and optimizing function through improved mechanics. For more information on coaching please visit the contact page. Good stuff , even for golfers!